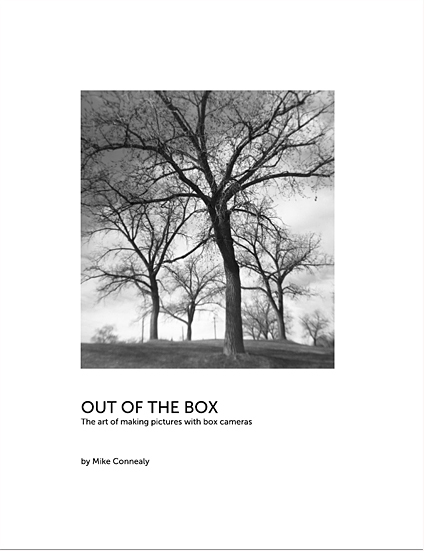 Fellow photoblogger Mike Connealy recently self-published a thin, charming book of film photographs he’s taken with a few of his box cameras. You might not think that such simple cameras can be used to create fine art, but page after page Mike’s book shows these old boxes’ artful capabilities. You can look at Mike’s book online here. If you’d like to own a copy, you can buy one here for a price so nominal that he can’t be making any real money off the venture. After viewing and enjoying Mike’s work online for years, I really enjoyed seeing it printed. It’s easy to forget in this age of digital imaging that photographs were, for most of their history, a physical medium. And in printing a photograph, you exert final control over the image, not only in its size but in its density and contrast and how it renders highlights and shadows. An image on a screen is subject to the screen’s vagaries. The screen could be calibrated in any number of ways that affect the photograph and potentially take it far away from the photographer’s intentions. Mike’s self-publishing experiment has triggered an interest in me in trying the same thing. I’m not entirely sure what I want from it beyond seeing my photographs bound and in the hands of others. Do I just want my printed work in a few peoples’ hands for their enjoyment, or do I want to make a little money off it perhaps to fund further photography? Do I want to do the work of marketing the book, even if only through this blog and Facebook and Twitter? How would marketing my book affect the relationships I’ve built with you here? And would anybody want to buy something that’s not too different, in content and style, from what they get on this blog for free anyway? And finally, where will I find the time for all of this? I don’t know. But what I do know is that I started this blog on a lark in 2007, unsure what I wanted from it — and with experimentation and persistence, in time its purpose took shape and people like you started visiting regularly and enjoying my work. I can take much the same approach with this venture and see what happens. If I decide to move forward, I’ll chronicle the journey all along the way here. Ooohhh! I’m so excited at the prospect of a Down the Road photography book (or whatever topic you decide to focus on — it’ll still be wonderful). I’ve self-published a handful of books through Blurb myself and can tell you that even if you don’t actually sell a single copy, the process of curating your images and doing the layout and then seeing your handiwork in print is its own reward. And would anyone want to buy something that’s not too different than what you’ve posted on your blog? Oh my, yes. You’ve posted *a lot* on your blog over the years — far more than you could even include in a book — so I’d be interested to see what you choose to include. Plus, it’s a different experience to hold a book of photos, isn’t it, than to see them on the screen? So, in short, this reader says, “Go for it!” I’ll be eager to follow your journey. Thanks, Heather! Somehow I knew you’d be an encourager. I think the first thing to do is figure out what I want the book to show. You know, a theme or a topic. I’m just infatuated right now with the idea of making a book…the rubber will meet the road when I figure out what it will contain. PS: Mike’s book is *astounding. * Like you, I have no idea how he can sell it so cheaply — but I’m glad, because I’ve just bought two copies. Thank you for sharing the link, and for introducing me to his wonderful blog. The one shot from the Day of the Dead, of the two women, is my favorite of all his photos, ever. I agree! That was the image that stopped me in my tracks and cinched the purchasing decision. This is exceptional…I’m getting rid of my Hasselblad right now and concentrating on this! All joking aside it’s a good example of what can be done with minimal stuff! Mike is good at figuring out a camera’s limitations, and then doing the best work possible within them. I’m extremely leery of Blurb for photobooks. There’s no standard of quality and I’m still getting over getting burned by a photographer that thinks consumer inkjet on computer paper is high quality. Maybe I’m spoiled by finding great books used for under $10, but when I don’t know what I’m getting beforehand, I’m a lot less likely to buy. My class has to a book ourselves this semester, and while Blurb was mentioned in passing, she’s pushing for us to make them ourselves. I dunno if that will end up being better quality or worse…. On his blog, Mike described the process of making the book. Blurb gave him a proof copy and let him make adjustments until he was satisfied. I suppose there’s some risk that after that vagaries in the printing process (as this is on-demand printing) could mess things up. But it’s all about what you’re trying to accomplish. After holding Mike’s book in my hands, I was satisfied with the quality of the paper and of the images on the pages. I think this will be sufficient for what I’m trying to accomplish, at least for a first outing. I’ve actually seen some great books from Blurb. It’s really about how much you understand about the printing process, and how well your scans are (from film), or how well all your digital photos (and scans) are balanced withing accepted print industry standards. There IS a Blurb “Pro” division last time I was on there, which is even closer. I had a couple of friends who did a retrospective of their photography work (all scans from ‘real’ film), on Blurb, and the hardcover book was quite striking! The gallery they were working with for the retrospective, set them up with a designer who had print industry experience and tweaked the files to work best with the Blurb process. “Joe Shoots…” says he needs it for class, so he must be either relatively young, or relatively inexperienced in the field. It’s good to remember that prior to the internet, there was an over 100 year business getting print and pictures on paper, and people made really pretty good upper-middle-class money (even in my lifetime), making separation plates for 4 color printing from film, and getting it perfect. A lot of those parameters in the industry still exist, like judging your work on RGB and sRGB print industry monitors, and fitting shadows and highlights into accepted print industry standards via measurement. The closer you are to having a working knowledge of that stuff, the happier you’re going to be with direct-to-press operations like Blurb. I’ve mentioned my friends book above, but I’ve actually seen more than a few Blurb books that were exceptional, and probably better than the average direct-to-press printer. I ordered one of Mikes books as well, because I’m very interested in his work with cheap box cameras, but “ouch” on the shipping! That’s the real gotcha for me, Andy: “how well all your digital photos (and scans) are balanced withing accepted print industry standards.” I worked in the print industry (in editorial, mind) for a few years full time and freelance, and I couldn’t tell you what those standards are! But I do know what my eyes like, and if/when I do this I’ll just work with Blurb to adjust the proofs until I’m happy. I’ve been aware of on-demand printing since 1997 when I did some on a work project. It was a Xerox process, IIRC; we sent them PDFs with crop marks and they made books out of them. It worked really well even then, but those were technical manuals and so fidelity was far less an issue than a book of fine art photos! Yes, the shipping from Blurb is high. I have to assume they’re skimming a little extra profit there. Could work. The problem is when the photographer is satisfied with what I would consider substandard quality. I just don’t know if I can ever buy a Blurb book again. What amazing photos from simple box camera’s thanks for sharing Jim and I agree there’s nothing like seeing your work in print it’s a whole new experience to seeing it digitally so I would deffo go for it Jim. Thanks Christopher! Now to figure out what I want the book to include. I have done a number of photo books. They are a excellent way to preserve memories. When we go on family vacations I will do a book and then give copies to the different families that came. They are relatively simple to do. I have made books with several different companies and found that they are similar in quality. I think the photo books from Adoramapix are superior to blurb books. Their photos are printed on photo paper and they lay flat. They are more expensive than blurb books. I think you would find a market for a book. How many you could sell is any bodies guess. To sell a large quantity you have to market, market, market! You might want to consider a book on your Michigan Road Travels. I’ve done a couple photobooks as gifts, through Flickr. I like them. I’m sure I’d like the Adorama books too. But it seems to me that for a book that I would essentially sell through the blog, price will have to be a leading factor. Unless I become internationally famous for my photo books, that is. Anyway, the Blurb offering would allow me to do a thin softcover book for under $20 shipped, which seems like a low-friction price. I ought to do some research into other options, but the nicer books with nicer paper and bindings are almost certainly not going to come in under $20. The Michigan Road would be a great subject but unfortunately I’m not happy with most of my photography from the road. I traveled it in 2008 and I’ve grown so much as a photographer since then. Honestly, most of those photos are rough snapshots. I really want to drive the whole road again with my camera and get better shots. I applaud your desire to print your work Jim. I have not thought about printing any of my photography since the 1990s when I had my own home darkroom. The process of printing my photographs and then holding them in my hands was satisfying. Can’t wait to see what you come up with. Thanks JR! The couple of gift photo books I did through Flickr were satisfying, so I expect this to be, too. BTW, I got a recommendation for Fomapan 100 as relatively inexpensive b/w film, so I’ve got some in the F2 now. That was quite a surprise to see my cover pop up on your blog. Many thanks for the free publicity. I’m still pretty impressed with the BLURB’s Bookwright software. It was easy to learn and the hard copy product produced no unpleasant surprises. As to the quality, I think it comes very close to that what one finds in the good photo magazines. I made an effort to keep the page count small and only added a small profit margin as I wanted something which would be affordable in spite of the rather stiff shipping charges. I believe you can get a considerable discount bulk orders, so that would probably be the route to take if you are serious about marketing your book. Blurb will also make you a nice pdf version which only has a one-time small fee and that can then be distributed at virtually no cost. There are certainly alternatives to Blurb to explore. I think Nitsa at More Than Photography uses Etsy for marketing. I’m not sure what desktop publishing software she uses. Her blog at http://nonphotography.com/blog/ is a good example of a comprehensive effort to make a go of self-publishing. Even if you have outstanding work to offer, it is not likely to succeed without the kind of effort she puts into the enterprise. The open source Scribus dtp package is also worthy of consideration. My impression is that most of the photo books one finds in the Blurb on line store are produced for limited personal and family use. Very few show any sophistication in layout, and fewer still add any narrative context for the photo work. I would look forward to seeing anything you come up with in this regard. Your skills in photography and writing are certainly a plus for such an undertaking. Judging by the comments, you scored a few sales today! Which is awesome. Thanks for sharing your experience with Blurb’s software and output quality here. Hopefully it sets some minds to rest. I am thinking of this (potential) book as an experiment, to see how it all works. I like the print-on-demand model for that, as it avoids inventory needing to be kept anywhere and eliminates worries about sell-through. I, too, will stick to a thin volume, probably in the magazine format, to keep my final price low. I want the purchase to be as low-friction as possible. I do have some background in book interior design. 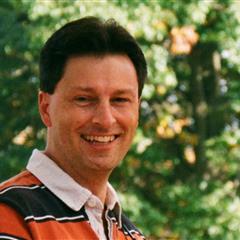 20 years ago, I was an editor for a technical publishing house — the For Dummies series. And as a technical writer, I once designed the interiors of a series of books. But those are pretty rusty skills. Thank you for saying such nice things about my work. I wonder if you have ever thought of making some of your Michigan Road photos into a book for a fundraiser. I think there might be some people interested in that. I did a book with Blurb a while back and liked the results. I remember reading about how Jason Schneider had a large photo in his office that he had taken with a box camera. He said that he often had people thinking it was taken with a Hasselblad. I’m actually not all that enthusiastic about most of my Michigan Road photos. I’ve come such a long way as a photographer since I took most of them, back in 2008. I would very much love to drive the road again with my camera in my pocket, and then publish a book of photos! It doesn’t necessarily have to be a retrospective; it could be the impetus for a new project.I can see you doing something like Ed Ruscha’s 26 Gasoline Stations. I’m always interested in both the subjects and the style of your architectural photography. I say that as someone who generally has no idea on how to approach photographing a building. Or how about those massive store ‘totem poles’ ( I don’t know what they’re called) you have over there? You know, like those lying ones I drove past every day when I was in LA: ‘Arby’s Roast Beef Sandwich Is Delicious’. Perhaps they seem very mundane to you, but as a Brit they always look very exotic to me and bring to mind the America of Jack Kerouac, Robert Frank, The Postman Always Rings Twice etc etc. Anyway, my ramblings aside, I’m very interested to see what you do and hear about how it goes. I like your idea of taking a look at a particular subject class as I’ve photographed examples over the years. I will have to chew on that one. Life is too short to wonder what if… Go for it. Worst that can happen is you don’t want to do it again. I took some pictures of a car that a friend restored for his dad. His mom had the pictures made into a book telling the story of the restoration. The book came out wonderfully well. My only regret is that I did not get a copy. (It was not an on demand publisher). She sure made my work look good. Make your book. There is still immense power in the printed page. Thanks so much! The main obstacle is time, but if I take it one step at a time, I’ll get there. Hey Jim, great post. First of all, thanks for sharing this photographer’s work, it’s fantastic! Secondly, really good points on making the book. I’ve often thought the same thing, most importantly to me, as you mentioned, how the viewers would take to it. Would they buy it? Would they think I was a self-promoting schmuck? You know what, after you’ve been posting on the net this long, and doing photography even longer, I think you should do it, even if it’s for nothing else, but your own satisfaction. I have friends who have done it, some sold, some didn’t, but all were happy to have done it. Every photographer should have their work in a book and not just on the net. And if you do, please be sure to inform us!! I started this blog for my own satisfaction, so at least there’s precedent! :-) Thanks for the encouragement, Sam. For those who do not know the history of printing, etc., you should know that in the ‘olden days’ (well, at least 40 years ago), trying to do a black & white photo book on the cheap would have probably meant ‘single plate’ black & white: i.e. only one printing plate. Images would have been pretty compressed, and very dependent on quality of paper. These direct-to-press books, when done well (which this one certainly is), approach the quality of a high-end dye printer or even a ‘multi-plate’ black & white printing job (where multiple plates are used and dedicated to high-light detail, and shadow retention etc.). This new era of printing certainly fits in-between the old, bad, single plate job, and the thousands of dollars quad-plate printing job very nicely. I was happy with the quality of the copy I bought, too. Thanks for the printing history lesson! It’s truly amazing how easy and inexpensive it is to print good-quality work these days.